Silberra ST-2 is a contrast fine grain film developer with minimal grain and good light sensitivity, it provides wide gamma of halftones and has minimal fog level. Looking at final image details, this Developer can be attributed to transitive between standard negative developers (such properties like high contrast and no tinting) and equalizing developers (low graininess, high tonal range). Contains anti-fog agent. Silberra ST-2 is supplied as a set of reagents in two separate packages, designed to create 1 litre of working solution. 1) Warm 750 ml of distilled water up to 30-35 Celcium degrees (use mix of hot and cold water, or use microwave for warming up the water). Filtering the solution is not obligatory but recommended option. Average development time for photo films in newly made Silberra ST-2 developer working solution will be 7-8 minutes at a temperature of 20°. Optimal time to process specific films is stated either by manufacturer of the film or can be learned from the development times table at this page (the table is being constantly updated). Silberra ST-2 Developer working solution is recommended for one-time use. However 1 litre of the Developer can be used to process up to 8 films of 135 type or up to 3 films of 120 type, subject to an increase in processing time of 10% for each film after the first. Darkening or slight tinting of the working solution will not affect final quality of images while working with films. Please note that tinting or darkening mean that the developer is being exhausted and must be used with caution (increasing development times of 20% minimum) or not used at all. Keep Silberra ST-2 Developer in a cool, dry and dark place. Keep away from children. It is optimal to store your working solution in opaque, chemically inert and tightly sealed containers with minimal air space in order to reduce oxidation. 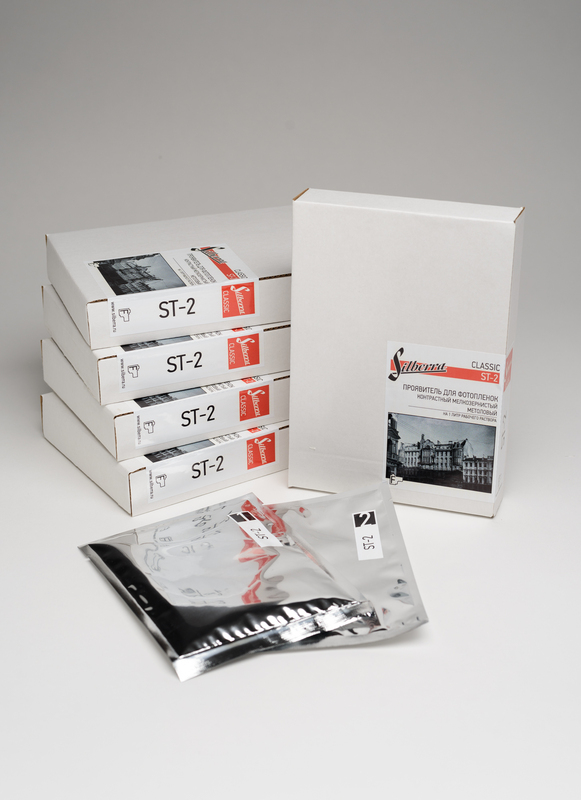 Silberra ST-2 sealed powder packs can be stored up to 12 months past the production date; ST-2 Developer working solution can be stored up to 4 months past the production date, and, if used, no longer than 20 days past the first use.